Tonight's JHL Div. 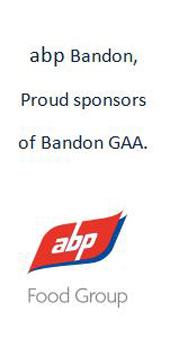 2 Fixture vs. Kilbrittain is going ahead as scheduled in Bandon.Best of luck to players and management in their first outing this year. U21 Football Championship vs. Gabriel Rangers in Union Hall at 4pm is going ahead after a pitch inspection. POSTPONED - Division 2 Hurling League vs. Fermoy. Please note that the Division 2 Hurling League Fixture vs. Fermoy scheduled for today is off due to both clubs pitches being unplayable.An alternative date will be published when finalised. All roads lead to Castlehaven next Saturday March 2nd as our U21 Footballers start their championship campaign against Gabriel Rangers.Throw in is 4pm. Note the match is in Union Hall and not Moneyvollahane. Please support. Jigsaw 'One Good Coach' workshop. Tues 19th Feb @ 6.30pm. Bandon GAA would like to wish Ben, Tim, Eolann, Harry, Cathal, Charlie, Conor and their team mates from Hamilton High School the very best of luck on Saturday.Tom Collum Cup U19 B Final, HHS v St Francis College, Rochestown in Pairc Ui Rinn at 12.00. Fixtures this weekend - 16th/17th Feb.